Centralized Management, log and analysis appliance - 4 x GE RJ45, 2 x SFP+, 48TB storage, up to 4000x Fortinet devices/Virtual Domains. With today’s challenging cybersecurity landscape, Security teams are falling behind due to resource constraints and an inability to keep up with the latest threats. Complexity and the unknown diminish security effectiveness – NOC-SOC helps to rejuvenate and strengthen your Security Posture. Operationalizing Security improves response time and awareness, and Fortinet’s Security Fabric is the foundation of that new approach. FortiManager provides one console to manage your network, giving you full control for your Fortinet devices with enterprise-class centralized management. FortiManager offers a common GUI to manage all your Fortinet products including FortiGates, FortiAPs, FortiSwitches, FortiClients, Managed FortiAnalyzers and more, reducing the complexity and number of skilled personnel required to manage the network. FortiManager provides a hierarchical objects database to facilitate re-use of common configurations and a multi-tenancy architecture to serve multiple customers. The graphical interface makes it easy to view, create and manage ADOMs. You can use ADOMs to manage independent security environments, each ADOM with its own security policies and configuration database. 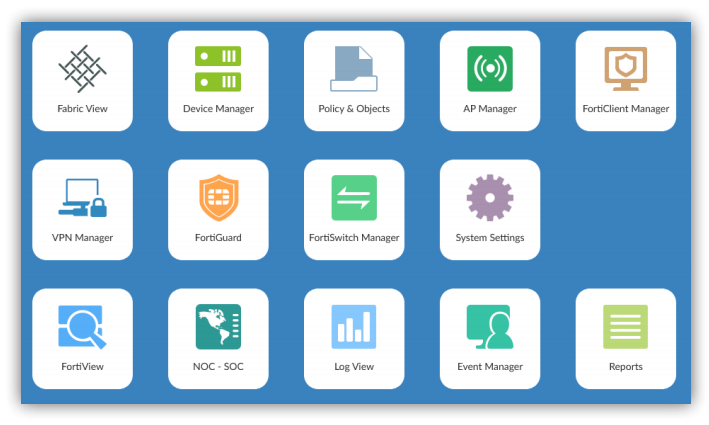 FortiManager enables you to group devices logically or geographically for flexible management, and the zero-touch deployment uses templates to provision devices for quick mass deployment. Define global objects such as Firewall Objects, Policies and Security Profiles to share across multiple ADOMs. Granular permissions allow assigning ADOMs, devices and policies to users based on role and duties. Collectively configure the device settings, objects and policies across your network from a single user interface. The VPN manager simplifies the deployment and allows centrallyprovisioned VPN community and monitoring of VPN connections on Google Map. 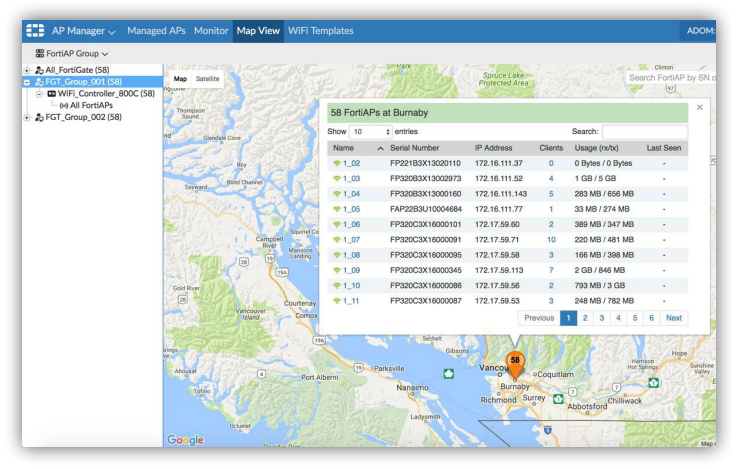 FortiAP Manager allows configuring, deploying and monitoring FortiAPs from a single console with Google Map view. The FortiClient Manager allows centralized configuration, deployment, and monitoring of FortiClients. FortiManager also provides the ability to centrally manage up to 100,000 FortiGate security appliances. FortiManager enables you to review, approve and audit policy changes from a central place, including automated processes to facilitate policy compliance, policy lifecycle management, and enforced workflow to reduce risk for policy changes. Host security content locally for greater control over security content updates and improved response time for rating database. Includes support for: Application Control and Intrusion Prevention updates, Vulnerability Management, Antispam, Antivirus and Web Filtering updates. Access vital security and network statistics, as well as realtime monitoring and integrated reporting provides visibility into network and user activity. For more powerful analytics, combine with a FortiAnalyzer appliance for additional data mining and graphical reporting capabilities. Centrally manage FortiAP access points that are controlled by FortiGate devices, through FortiManager. WiFi Templates allow you to create and manage AP profiles, SSIDs, and Wireless Intrusion Detection System (WIDS) profiles and assign to managed FortiAP devices. View FortiGate controllers on a map and monitor connected clients and information about all the APs for FortiGates (fig 2). FortiExtender can be used as a primary connection or deployed as a backup connection to ensure reliability. You can now use the new Add FortiAnalyzer device wizard to add a FortiAnalyzer unit to FortiManager to better support managed devices with logging enabled. All devices with logging enabled will automatically send logs to the FortiAnalyzer device. You can use FortiManager to remotely access FortiView, Log View, Events Managements, and Reports on the managed FortiAnalyzer unit. RESTful API allows MSSPs/large enterprises to create customized, branded web portals for policy and object administration. Automate common tasks such as provisioning new FortiGates and configuring existing devices. Join Fortinet Developer Network (FNDN) to access exclusive articles, how-to content for automation and customization, community-built tools, scripts and sample code. Centrally monitor SD-WAN performance. Monitor your devices on Map view with color coded icons and mouse over to view health performance statistics for each SDWAN link member. Table View provides more granular information for each SD-WAN link member, including link status, application performance and bandwidth usage. 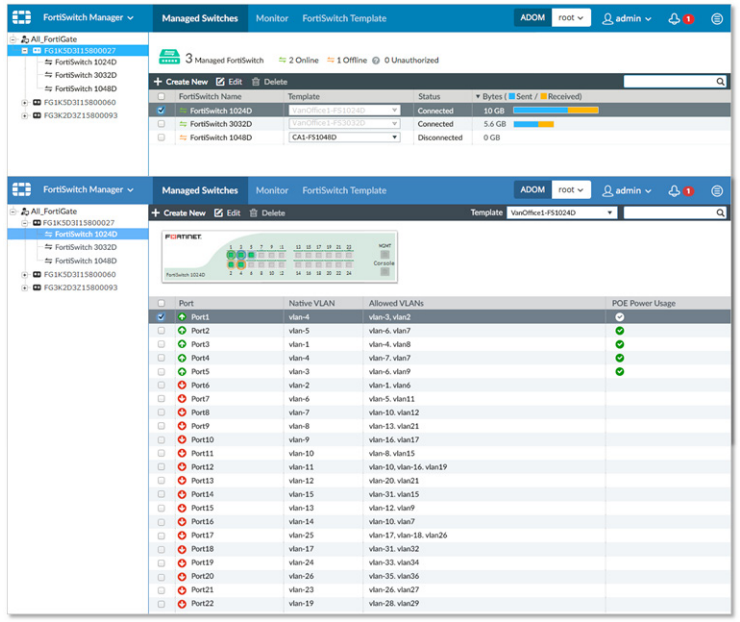 The FortiSwitch Manager module enables you to centrally manage FortiSwitch templates and VLANs, and monitor FortiSwitch devices that are connected to FortiGate devices. You can configure multiple templates for specific FortiSwitch platforms that can be assigned to multiple devices. View as a graphical representation of the connected FortiSwitch devices. 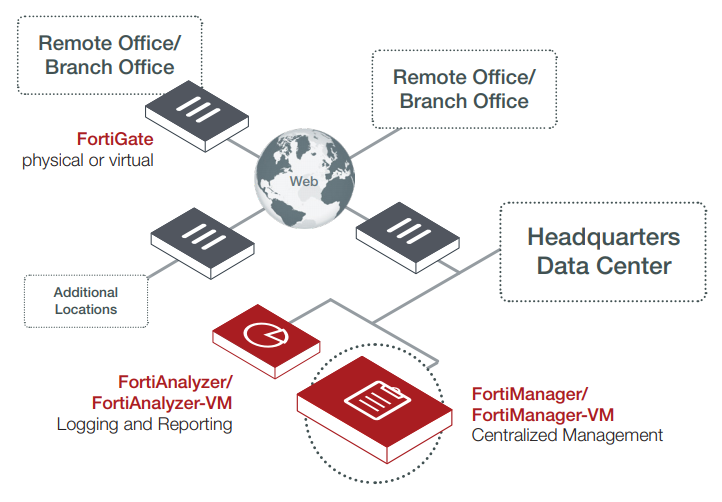 Download the Fortinet FortiManager Series Datasheet (PDF).